Martin Luther and the Reformation – Share God's Grace. Most people know the significance of December 7th, 1941, or September 11th, 2001. Some might remember where they were on November 22nd 1963. These dates represent significant turning points in history, points in time in which the world changed and we could no longer go back to how things were before. Few people may understand the importance of October 31st 1517. For many it is just an obscure date mixed in with many other obscure dates from a period long ago. If people had to guess most would say it was the first Halloween! 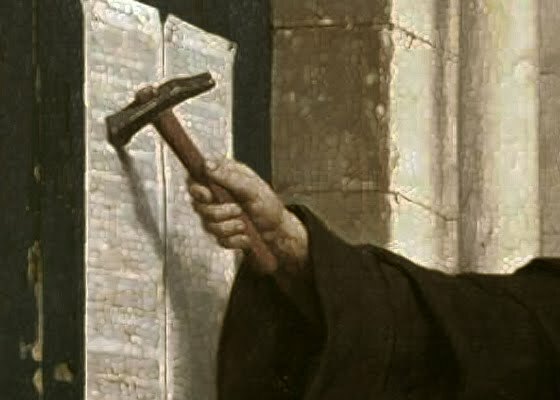 Many Lutherans are aware that on the last day of October in 1517, a teacher of theology at the University of Wittenberg made public a paper he wrote entitled “Disputation of Martin Luther on the Power and Efficacy of Indulgences”, which came to be known as “The Ninety-Five Theses“. It became a turning point that would change the world. Luther criticized the concept that sin could be remitted either through doing good works or paying to have them remitted. Remission of sin is not the same as forgiveness. According to Roman Church doctrine each person will spend time in purgatory and the time spent there is determined by the amount of “good works” or penitence a person did in their lifetime. This time could be reduced by paying an “indulgence” for themselves or for someone who has already died and is in purgatory. If enough money is offered one could skip purgatory altogether. The Roman Church of Luther’s time had fallen into decay, corruption and defilement. In order to support its elaborate building projects, corrupt political agenda and self-serving bureaucracy, the Church “sold” indulgences, assuring people that they or their deceased loved ones would reach God’s Kingdom quicker. Martin Luther struggled with the Church doctrine of earning salvation through human action. Despite his own effort to receive God’s grace he never felt he could do enough in prayers, confession, penitence or good works to be worthy of God’s saving grace. As a teacher Luther engaged in a deeper understanding of the New Testament. It was in the Book of Romans that he developed the concept of Justifying Grace. While it was not a revelation that happened in a blinding flash, the scripture from Romans 1:17 made Luther begin to understand scripture from a completely different perspective. “17 For in the gospel the righteousness of God is revealed—a righteousness that is by faith from first to last, just as it is written: “The righteous will live by faith.” ” What Luther came to believe is that Faith and Grace is for God to give, not for us to earn. They are a free gift given by a sovereign God because he chooses to give them not because we sought to earn them. This is why Luther openly challenged not only paying for indulgences, but the entire doctrine of salvation through penitence, confession, salvation and the sacraments. The publication of the “95 Theses” opened the floodgates that would give birth to the Protestant faith. This revolution had been fermenting for decades while the Church in Rome became more decadent and corrupt. The Reformation would have occurred without Martin Luther, but his intellect, courage and theology gave the reform movement foundation, and structure which caused the movement to spring forth and to flourish. His writings and the subsequent writing of others are still relevant today. It has shaped society, governments, economies and religious culture and will continue to do for ages to come.